The Rideau Heritage Route is a backbone of Canadian history in Ontario. The Rideau Canal links http://www.travelinontario.com/Ottawa.cfm to http://www.travelinontario.com/Kingston.cfm through a myriad of rivers and lift locks that traverse diverse geographies. History fans must catch Fort Henry in http://www.travelinontario.com/Kingston.cfm with its period music and military manoeuvres. The history of the Rideau Canal is explored at Rideau Canal Museum in http://www.travelinontario.com/SmithsFalls.cfm , which also has the Smiths Falls Railway Museum of Eastern Ontario and Heritage House Museum. The mis-named 1000 Islands includes http://www.travelinontario.com/Gananoque.cfm and since there are 1800 islands, it's worth the visit. Lanark County claims the title of "Maple Syrup Capital of Ontario," but there's likely rumblings of discontent from parts of southwestern Ontario. Two key natural areas include Murphy's Point Provincial Park the Frontenac Arch Biosphere Reserve, 150,000 ha (370,658 acres) area of preserved wilderness between http://www.travelinontario.com/Brockville.cfm , http://www.travelinontario.com/kingston.cfm and Westport. Accommodations on the Rideau Heritage Route includes hotels, motels, resorts, bed and breakfasts and campgrounds. This 1860 Merrickville heritage building features a European-style pub, a vintage gift shop and elegant guest rooms. Each room features air conditioning and cable TV. Coffee-making facilities and free Wi-Fi are provided. Guests at the inn are offered discount day passes at the Merrickville Fitness Centre. Smiths Falls Golf & Country Club is a 25 minute drive away. 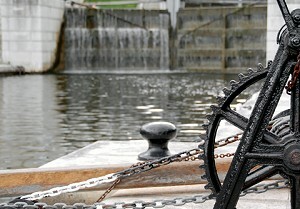 Our Smiths Falls hotel is within walking distance of the Rideau Canal Museum and minutes from other attractions. Enjoy high-value amenities, including free local calls and a free weekday newspaper. There is free wireless high-speed Internet access and access to copy and fax services. All air-conditioned guest rooms have coffee makers, ironing equipment and cable TV. Some rooms have refrigerators. We are located on the Rideau River in the tranquil town of Smiths Falls. Guests to this Ontario hotel will enjoy easy access to key area attractions and business locations including the Historic Rideau Canal, Hershey's factory with tours, 18 hole golf courses, the Heritage House and the Rideau Canal Museum. This Smiths Falls bed and breakfast is less than 2 km from County Fair Mall. It offers a daily breakfast (special dietary menu items are available upon request). On-site canoe rentals. Seasonal outdoor pool. 2 double rooms with ensuite bathroom. 2 single rooms with shared bathroom. A small seating area is furnished in each room. Individually styled rooms also include a clock radio. Come enjoy beautiful Kingston Countryside in our 1840's Limestone Manor. We are only 15 minutes north from 401 and 20 minutes from downtown Kingston in the Town of Battersea. Our Forest inn has free WiFi, a restaurant and a terrace. Free private parking is available on site. Each room is air conditioned and fitted with a flat-screen TV. Some rooms have a sitting area. A balcony or patio are featured in certain rooms. Every room comes with a private bathroom. For your comfort, you will find free toiletries and a hairdryer. You will find a shared lounge at the property.